LAWRENCE — The University of Kansas Department of Architecture will sponsor the 2015 Water Charrette: Food Deserts, to explore issues including urban agriculture, water harvesting and storage. The three-day event, starting Thursday, Jan. 22, will give students an opportunity collaborate and propose innovative design strategies for solving them. Communities are now trying to address the issue by creating gardens on vacant parcels of land in these areas. But, in order for these urban farms to be successful, they typically need large amounts of water. It may be either unavailable or too expensive unless onsite harvesting and storage can provide the water. 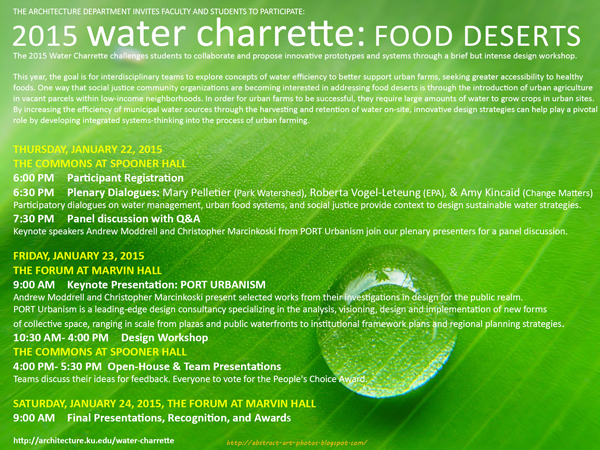 “Water Charrette: Food Deserts” will kick off at 6:30 p.m. Jan. 22 at The Commons at Spooner Hall, where Mary Pelletier, of Park Watershed, West Hartford, Connecticut; Roberta Vogel-Leutung, Environmental Protection Agency, Lenexa, and Amy Kincaid, ChangeMatters, Washington, D.C., will have a plenary dialogue on these topics. Andrew Moddrell and Christopher Marcinkoski, architects from PORT Urbanism, Chicago, will join them for a panel discussion. On Friday, Jan. 23 Moddrell and Marcinkoski will present selected works from their many public design projects, which include the Denver City Park City Loop, the Los Angeles Green Way 2020 Plan, and a redesign of the Helsinki South Harbour. The lecture will take place at 9 a.m. at The Forum at Marvin Hall. Following the keynote, teams of students will participate in a design “charrette.” Charrettes are intensive design sessions in which participants attempt to solve complex problems in short periods of time. This charrette challenges students to incorporate integrated systems-thinking into water harvesting and urban farming prototypes. They will present their projects at 4 p.m. at The Commons . Final presentations and awards for the design charrette will be given at 9 a.m. Saturday, Jan. 24, at The Forum. All students are welcome to participate in the charrette. For more information or to register, go to www.architecture.ku.edu/water-charrette.